Ever Navigated on a French Canal? When I learnt French at school, we used to watch a programme on TV once a week about a family of four who lived on a barge and used to travel throughout France along the canals. They had bikes and would go off and visit the neighbouring towns and villages whenever they stopped. It looked like heaven to me. I knew all about locks that raise and lower the boats when there’s a difference in the level of the water. Imagine that you are going from a higher to a lower area. The lock is like a big rectangular open tank. 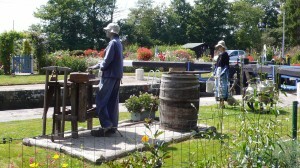 They close off both ends, using winding gear, fill the tank with water, then open the sluice gate in front of you. You take your boat in and they close the gate behind you. Then they empty the water until it’s low enough to open the gate on the other side (your boat goes down as the water does) and you sail out. If you’re coming in the other direction, the process is obviously reversed. It seems that Leonardo da Vinci invented this type of lock. Sadly, I’ve never fulfilled my dream to spend a week or two on a house boat, but we’ve cycled along many canals. 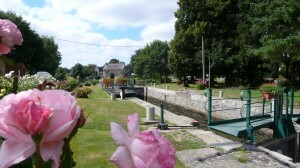 The most interesting for the spectator is probably the Ille-et-Rance Canal in Brittany. No doubt hell for the boats though because at Hédé, there are eleven locks over a distance of just 2 km. You can imagine the time it must take filling up and emptying all the locks. 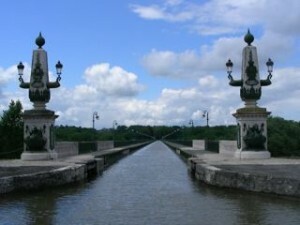 The canal was actually built during the first half of the 19th century by volunteers during the reign of Napoleon 1st. It seems that a few Spanish war prisoners and quite a large number of convicts and deserters were roped in as well. Sounds like Australia, doesn’t it? The locks on this canal are still hand-operated. 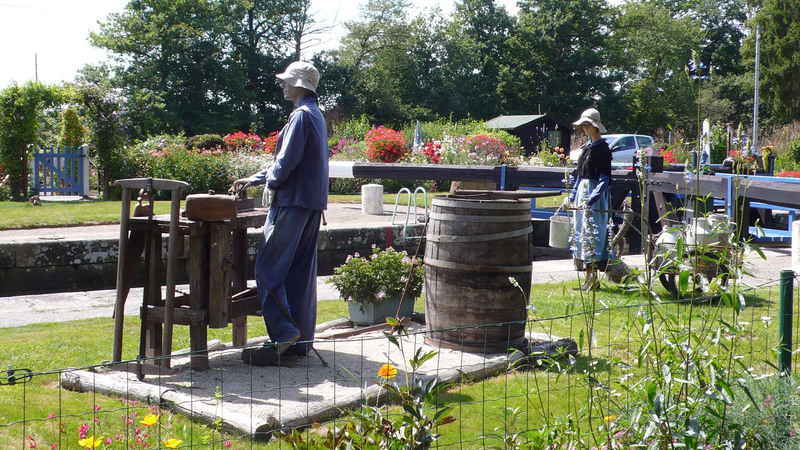 The lock houses are beautifully decorated with masses of flowers and some have realistic outdoor scenes from the olden days. 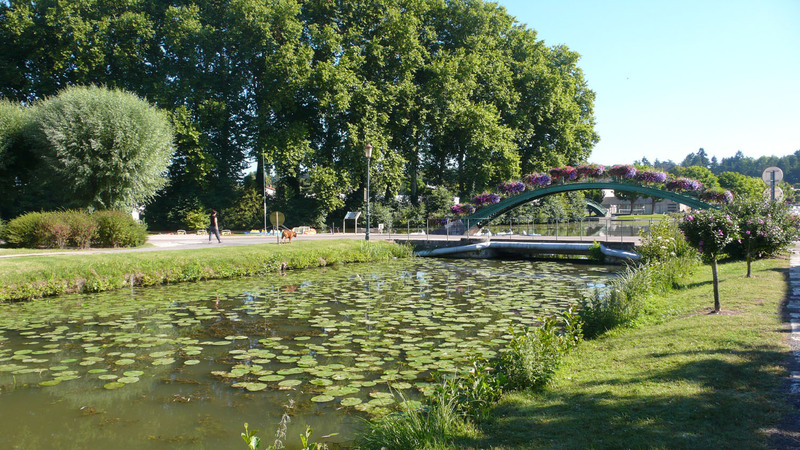 Another place where we cycled along a canal is Briare on the eastern end of the Loire Valley. There’s actually a bridge to take the canal over the Loire River, designed and built by Gustave Eiffel no less. There’s a footpath on each side so we cycled across it several times. Stunning at sunset. I was a bit worried about falling into the canal, which is rather stupid because the footpath is actually quite wide. 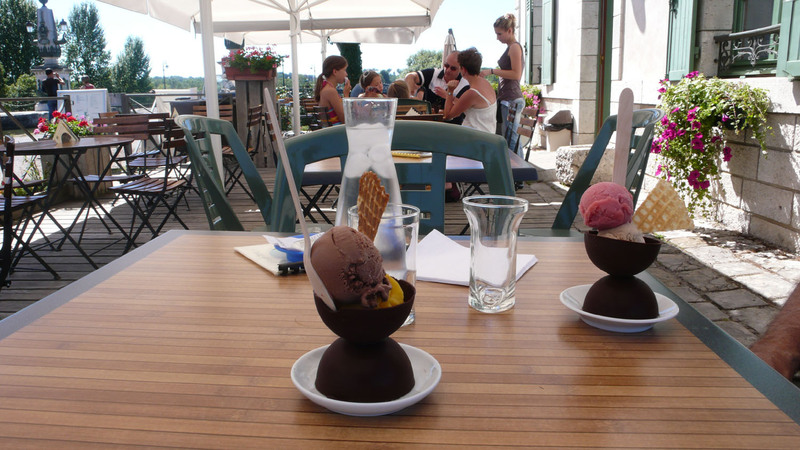 They have a wonderful ice-cream parlour at one end of the bridge where they serve the ice-cream in edible chocolate dishes. Plus a highly appreciated jug of iced water. We were staying in a B&B right on the edge of the canal that even had a barbecue we could use. So, côte de boeuf, ice-creams, cycling along the canal at sunset, having picnics on the water-edge at lunchtime. Not bad. Anyone else been on a river trip? 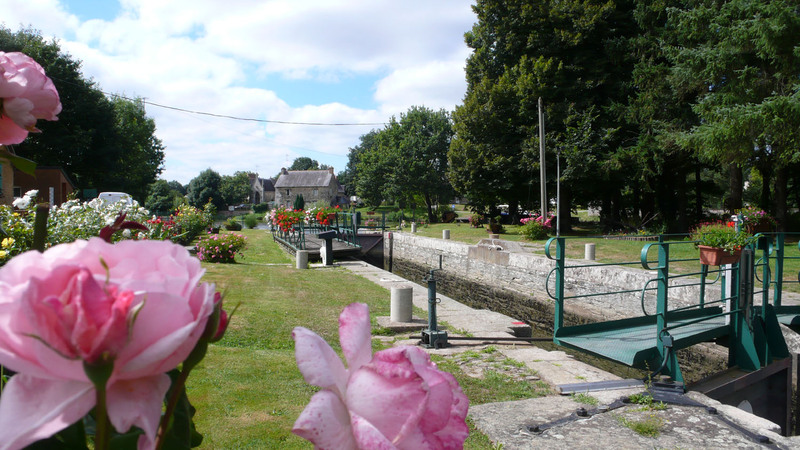 This entry was posted in Cycling, France, Loire Valley and tagged boating on canals, canals, cycling on canals. Bookmark the permalink. 2 Responses to Ever Navigated on a French Canal?